Villagers from Buyat Bay, North Sulawesi have lodged complaints with the police over the devastating health impacts of Newmont Minahasa Raya's gold mine. At least 30 people are believed to have died as a result of the heavy metal pollution caused by the mine, which dumps tailings on the sea-bed. With major new oil and gas developments planned for Sulawesi, there is growing concern about the likely impacts on local livelihoods, forests, rare wildlife and the fragile marine ecosystem. 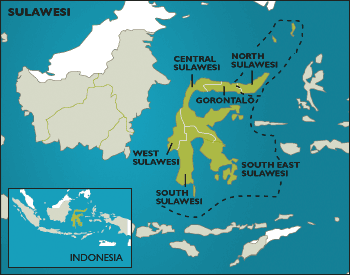 Central Sulawesi is being billed as Indonesia's next big gas producer by Indonesian companies with exploration projects in the province. Indonesia's state-owned oil and gas company, Pertamina, and Exspan Tomori Sulawesi - a subsidiary of Medco (see box) - say the province has huge potential for natural gas exploitation. Indigenous communities whose forests have been plundered by logging companies are demanding compensation for the damage. Deprived of the protection they enjoyed under former President Suharto, the companies are having to take them seriously. AMAN, the Alliance of Indigenous Peoples of the Archipelago, was created as a result of the Indigenous Congress held in Jakarta in March. Since then, this first national indigenous peoples' organisation has begun to make its presence felt in a number of ways. Regional meetings of AMAN have been held in several places between July and September.